Every year an ever-expanding group of morons gathers to celebrate Stalin’s birthday and reminisce about the greatness of the Stalin’s years in the Russian history. 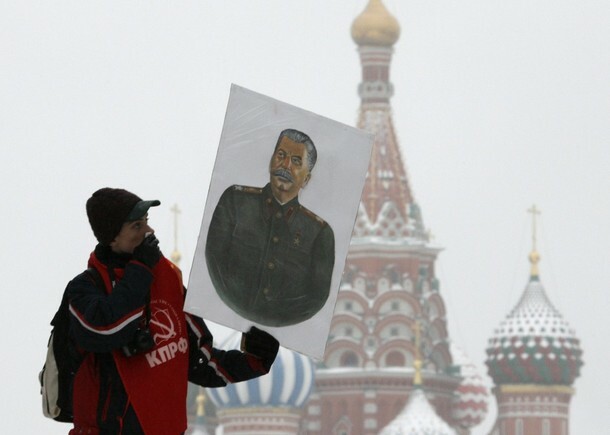 Considering that a person born in 1953 when Stalin died is quickly approaching the age of 60, not too many people in the crowd actually remember the life under Stalin but that doesn’t stop them from marching around, dreaming about going back in time. The irony is in the fact that during Stalin’s times marching around or expressing disregard for the current regime would be a sure-fire way to get shot or be sent to labor camps. 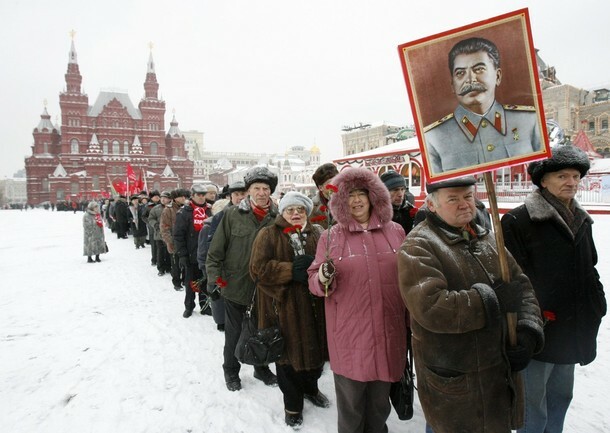 Russian communists stand in line in Red square to attend a wreath laying ceremony at the tomb of Soviet dictator Josef Stalin marking the 130th anniversary of his birthday at the Kremlin wall in Moscow, December 21, 2009. And here we see a group kids whose parents could use a few months of labor camps themselves. 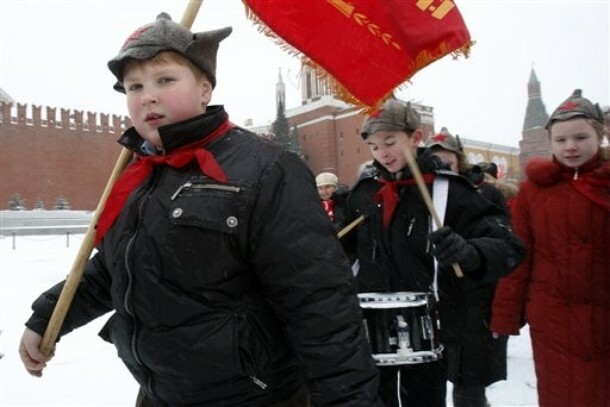 Members of the youth wing of the Russian Communist party march along Red Square to lay flowers at Soviet dictator Josef Stalin's grave to mark the 130th anniversary of his birth in Moscow, Russia, Monday, Dec. 21, 2009. 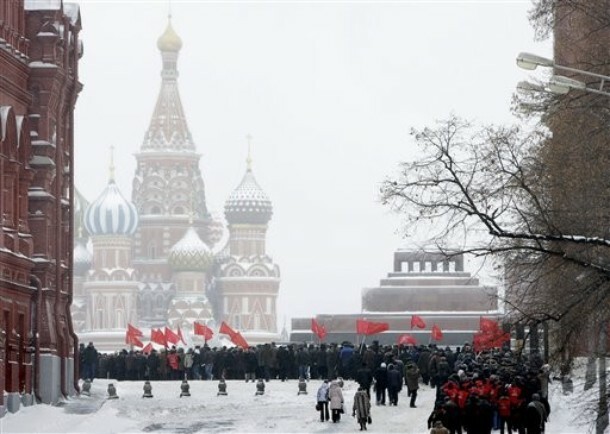 Russian Communists hold red flags as they queue to lay flowers at the grave of Soviet dictator Josef Stalin to mark the 130th anniversary of his birth, as they walk along the Red Square in Moscow, Russia, Monday, Dec. 21, 2009. St Basil's Cathedral is seen at left and Lenin's mausoleum is at right. 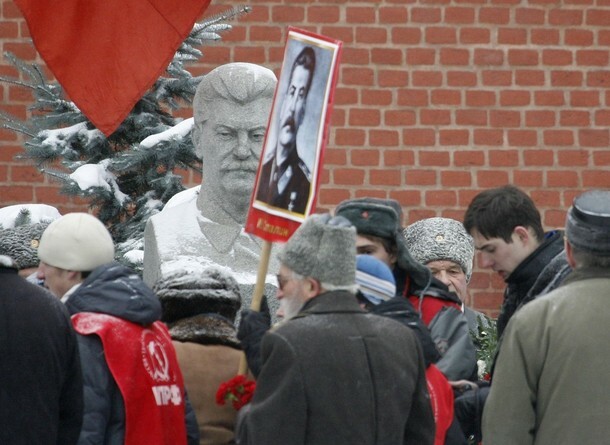 Russian communists attend a wreath laying ceremony at the tomb of Soviet dictator Josef Stalin, marking the 130th anniversary of his birthday, at the Kremlin wall in Moscow December 21, 2009. A Russian communist walks along Red Square after attending a wreath laying ceremony at the grave of Soviet dictator Josef Stalin marking the 130th anniversary of his birthday at the Kremlin wall in Moscow, December 21, 2009. 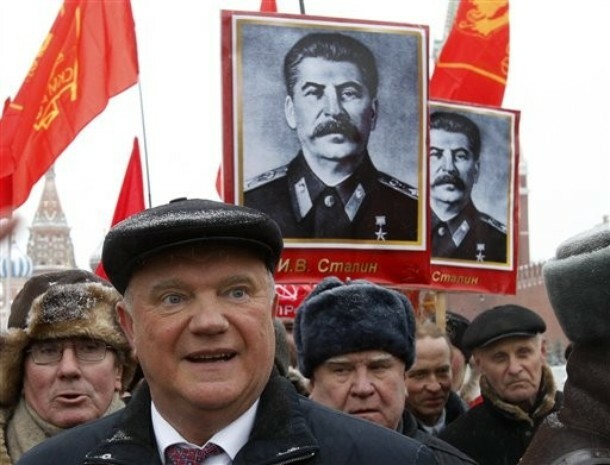 Russian Communists leader Gennady Zyuganov, 2nd left, smiles as others hold portraits of Soviet dictator Josef Stalin after laying flowers at his grave to mark the 130th anniversary of Stalin's birth Red Square in Moscow, Russia, Monday, Dec. 21, 2009. 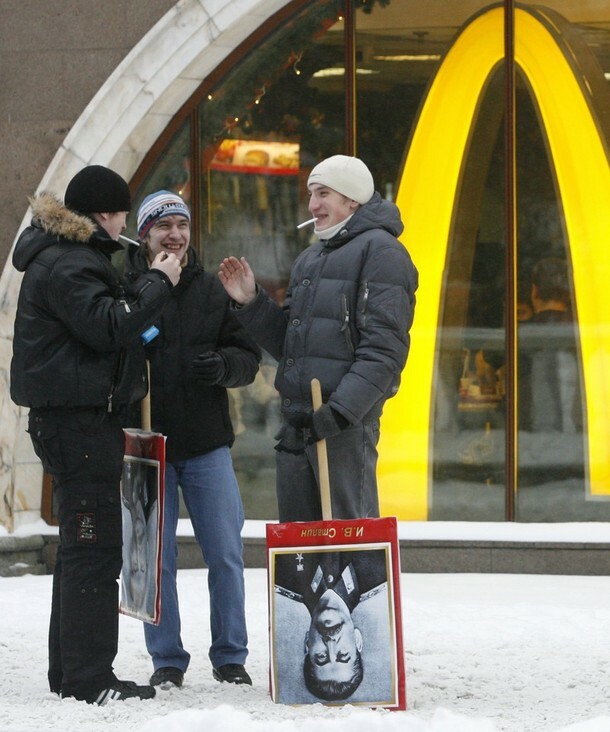 Russian communists laugh in front of a McDonald's restaurant after attending a wreath laying ceremony at the grave of Soviet dictator Josef Stalin, marking the 130th anniversary of his birthday, at the Kremlin wall in Moscow December 21, 2009. Few photos from Gori, Georgia where Stalin was born. 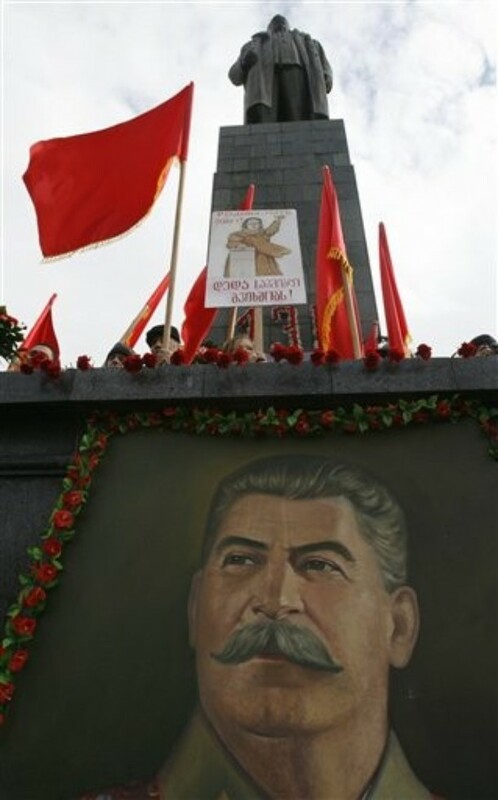 With a statue, background, and portrait, foreground, of Soviet dictator Josef Stalin, Georgians attend a rally marking his 130th birthday anniversary in Stalin's home town of Gori, 80 km (50 miles) west of the Georgian capital Tbilisi, Monday, Dec. 21, 2009. 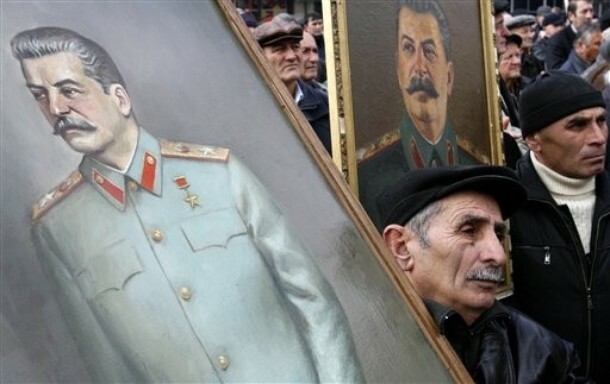 Georgians carry portraits of Soviet dictator Josef Stalin during a rally marking his 130th birthday anniversary in Stalin's home town of Gori, 80 km (50 miles) west of the Georgian capital Tbilisi, Monday, Dec. 21, 2009.